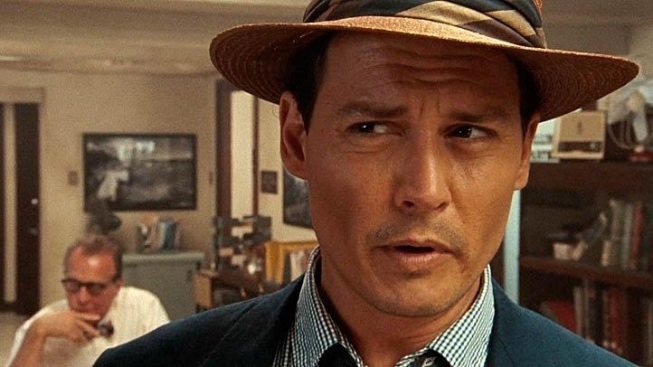 Johnny Depp Delivers 470-Proof Trailer for "The Rum Diary"
Johnny Depp's "The Rum Diary" has for too long now been a white whale for movie fans--but the hunt is almost over, Ahab, as a trailer has finally arrived. Based on the novel by Hunter S. Thompson, "The Rum Diary" tells the story of Paul Kemp, an American journalist who moves to Puerto Rico in the late '50s and falls in love with Chenault (Amber Heard), a beautiful woman who is already with a sleazy businessman named Sanderson (Arron Eckhart). The cast also includes Giovanni Ribisi and Richard Jenkins. Back when he was still an actor, Depp played Thompson brilliantly in Terry Gilliam's "Fear and Loathing in Las Vegas," and here is playing essentially a younger version of the same character. “The Rum Diary” tells the increasingly unhinged story of itinerant journalist Paul Kemp. Tiring of the noise and madness of New York and the crushing conventions of late Eisenhower-era America, Kemp travels to the pristine island of Puerto Rico to write for a local newspaper, The San Juan Star, run by downtrodden editor Lotterman. Adopting the rum-soaked life of the island, Paul soon becomes obsessed with Chenault, the wildly attractive Connecticut-born fiancée of Sanderson. Sanderson, a businessman involved in shady property development deals, is one of a growing number of American entrepreneurs who are determined to convert Puerto Rico into a capitalist paradise in service of the wealthy. When Kemp is recruited by Sanderson to write favorably about his latest unsavory scheme, the journalist is presented with a choice: to use his words for the corrupt businessmen’s financial benefit, or use them to take the bastards down. We're thrilled that this film is finally coming out, and delighted to see Depp not dressed as a pirate or some Tim Burton bastardization of a beloved kids' story, but we're a little concerned by the tone and and soundtrack, which give the whole thing a somewhat "wacky" vibe. Writer-director Bruce Robinson ("Withnail & I"), who hasn't released a film in nearly 20 years, was so frustrated by the process of adapting the book that he gave up more than 6 years of sobriety so he could get into the proper mindset of the characters. "The Rum Diary" opens Oct. 28.